My HUD has slowly become a mess. This seems to a recurring theme with my features — they slowly degrade as time goes on. And, yes, it’s my fault for adding and changing things. It’s probably also my fault for not having better upfront design. I just need to do 1 bar now — change 1 sprite. This is so much easier and I really should just stop adding over-complicated features (especially for UI) that I have to maintain later. 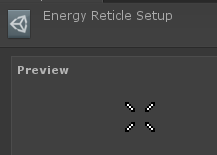 The left and right sprites are pixel perfect, while the middle one is stretched. I hide or don’t fully show the edges of the stretched middle sprites, so you never see the glitchy parts. And the side sprites are correct, but I only show or reveal part of them that isn’t supposed to be stretchable. This won’t work with semi-transparent sprites and this won’t work if sprites have concave areas, but I don’t care. I really don’t want to write a custom shader for this. 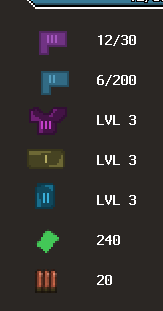 I also added the actual amount values as text labels to the bar. I can then set the width properties to scale the bar depending on the player’s (mob’s) actual health. I have been thinking about rockets, and I decided to not bother with such ammo types. I will just make the rocket launchers more balanced — slow-shooting, effective against clusters or big mobs, too inefficient against individual mobs, and does splash damage to the player if they are not careful. In other words, high risk, highish reward. I also don’t have to worry about showing it in UI, showing no-ammo, dropping ammo and balancing the amount. And that’s pretty much all the content that the HUD has at the moment. I almost removed more than I fixed, but at least I’m going in the right direction.